There is not an intimation in the New Testament that the success of the word of God anywhere depended upon a house of worship. A house of worship is not mentioned as being needful or even helpful to the establishment or upbuilding of churches of God. This would seem strange seeing they were entirely without houses and not many great or rich or noble came into the church, but the humble and poor. Yet it seems never to have occurred to them that a house of worship was needful. Now the general plea is that without a comfortable house of worship in a place even before there are members to worship, men can not be made Christians. I am constrained to believe there is more sinful waste in the building and use of houses in which to worship than in any other thing connected with religion. There are in Nashville one million of dollars invested in meeting houses that stand locked up six days out of seven, 144 hours out of 168. Where is capital invested to lay inactive like this save in religion? And what is true of Nashville is true of all the cities in the land. In the country it is even worse. In the country immense sums of money are put in meeting-houses that are opened one hour per week sometimes one hour in a month. Where save in religion, is there such a piling up of dead capital? What would be said of people that would put money into buildings to so lay idle in any other field than that of religion? There is a superstitious idea that these houses are God’s houses, are sacred, and the superstition is so gross that it would actually exclude God himself from the house save on the set occasions. Were you to ask the owners and guardians of one of these houses the privilege of teaching the Bible in it, in the sensible heaven-approved way in which other things are taught, they would refuse it. I am not opposing these houses, but the superstitious use or rather disuse of them, and the making the success of the cause of God depend upon having a meeting-house. They are not God’s houses. They are built for the comfort, and to gratify the pride of men and women. And any use of them for teaching the word of God that interferes with the gratification of that pride is refused. God is locked out of them except about three hours a week. Now the point I wish to make, is, why were houses of worship as a factor in the building up the church, wholly ignored in the primitive churches, yet regarded as so necessary now? How would a heading from Paul, “Left to Die” —sound, making the existence and success of the cause of God depend upon raising money to build a meeting-house, to be opened three hours in a week, kept locked against all admission, against God and others at all other time? It would be a discordant note in his writings. But says one, “It is impossible to build up the church of God without a house in this age and country. Experience shows it.” Why is this? We think there can be but one reason given. The article of religion we are trying to spread at this time is a very inferior one. In the days of the apostles it was of a character that it was spread not only without houses of worship, but frequently the preacher preached from behind prison bars and wearing a chain. They worshiped in upper rooms, in caves of the earth, and at times in the catacombs of the dead. The religion of Christ, as he gave it, could overcome and survive all these difficulties, and run and prosper in spite of them. It must be a degenerate specimen of his religion that dies for the lack of a meeting-house kept locked up seven hours out of eight. And it seems to me a sinful waste of means, when whole states and territories are without the preached gospel, to bury three or four thousand dollars in one house, to be opened three hours in a week. The religion that requires that to keep it alive, is not worth keeping alive. As a comfort to the people needing the house, unable to build it, I have encouraged and helped, usually in building houses. Have spent money against the protest of my conscience, feeling that it had better be spent in preaching, but when it is presented that the cause will die without the house, I feel like saying, let it die, it is not worth preserving. Money given to build houses is not given to the Lord. He has not asked money for such purposes. He may give us credit for what we thus do as kindness to our brethren. Excerpted from “What Is Needed to Keep Alive and Spread the Church of God” (Gospel Advocate 33.26 [July 1, 1891]: 404–405). 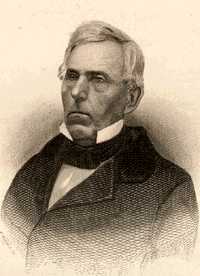 In the late 1850s, the defections of Jesse B. Ferguson (1819–1870) and Walter Scott Russell generated a good deal of discussion in the papers. I found this piece from J. W. McGarvey to be particularly insightful on the subject of the character of the false teacher. “A man that is a heretic, after the first and second admonition, reject; knowing that he that is such is subverted, and sinneth, being condemned of himself” — Titus 3:10, 11. It is often urged in extenuation of the conduct of a schismatic, that he is a good man, and most likely prompted by good motives. It is a fact that the majority of factions are headed by men in good repute for correct moral and religious deportment, and it is accounted for by the fact that only such men can attach to themselves any considerable number of adherents. This circumstance renders the exercise of proper discipline in such cases quite difficult. Apart from the mere act of schism, there is nothing that can be urged against the offender, and for this act he urges the controlling authority of his conscience. I have never known a mover of faction, however depraved he might finally prove to be, who did not stoutly and loudly protest that he was impelled to his course by a stern sense of duty. What to do with so conscientious a disturber of the peace, is a question that puzzles the minds of brethren. The text quoted above was written in anticipation of this difficulty, and to relieve us from it. The word here rendered heretic, means a schismatic, a factionist, one who causes division. The Apostle enjoins it upon Titus to ‘reject’ every such character, after the first and second admonition, ‘knowing that he that is such is subverted, and sinneth, being condemned of himself.’ According to this injunction, the fact of schism being ascertained, we need look no further for evidence of the wickedness of the schismatic. Whatever may be his conduct in other particulars, or whatever the degree of his apparent piety, if he is a schismatic, you may ‘know,’ all doubt being removed, that he is ‘subverted’ from the path of rectitude, ‘and sinneth,’ and even bears in his conscience a sense of guilt, ‘being condemned of himself.’ In such cases, then, all empty professions of conscientiousness, and all appeals to past good conduct, are to be treated as the idle breath of a hypocrite, and the stern penalty of rejection is to be unhesitatingly inflicted. 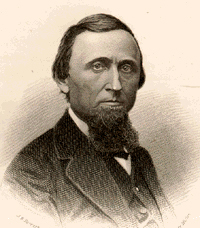 I was struck by Brightwell’s rhetoric. He almost gets carried away, it seems. We can follow his words out to the point where the Ryman takes a place alongside the Cane Ridge meetinghouse and the Bethany church in the pantheon of sacred spaces for the churches of Christ. In Brightwell’s rhetorical construct, the Ryman becomes not solely (as it would become later) “The Mother Church of Country Music,” but the Mother Church of the renewed and rebuilt Jerusalem of the churches of Christ. As with other writers among the churches, Nashville is Jerusalem. But Jerusalem has been allowed to crumble and it must be restored. Hardeman is the man—the only man—for the job. As we see here, expectations for the meeting were high and the rhetoric of the speakers rose to meet those expectations—and to stoke them even further. I’ve been reading J. E. Scobey’s Franklin College and its Influences (1904) of late. Scobey’s book is part biography of Tolbert Fanning, part history of Franklin College, Fanning’s short-lived school. Christian Review (1846), quoted in Scobey, pp. 24-25. Snippets from the pens of Fanning and David Lipscomb along these lines could easily be multiplied. Fanning’s writings frequently feature attacks on wealth in the Church and push through the lines we usually draw in contemporary American society (and American Christianity) about wealth and poverty, socioeconomic and educational status. Franklin College — and its institutional descendants, the Nashville Bible School (1891) and Alabama Christian College (1912-1922) — were characterized by a deep commitment to the value of manual labor and of education of the poor. In Nashville, these commitments are what set NBS in its early years apart from schools like Vanderbilt University and Ward-Belmont College, schools that indeed were open, but open for those who could afford to pay. As time went on, the pedagogical vision of Fanning and Lipscomb was forgotten in the quest of college administrators to conform their institutions to the prevailing standards of American higher education in the twentieth century, a quest that was paralleled in churches in the same period as Fanning himself suggests in this excerpt. As I said the other day, it is the human stories that one encounters in the Advocate that really have moved me in this process. 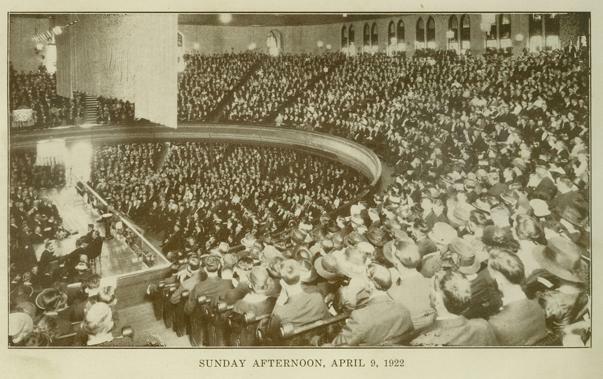 In May 1938, Cled Wallace (1892-1962) came to Birmingham to hold a meeting for the Bessemer church. We don’t know much about the outcome of the meeting as far as the usual measures. J. R. Ezell (1886-1966), elder and preacher for the Bessemer church, did not submit the normal tally of baptisms and restorations. Neither did Wallace submit a report of his own. John Morgan Queen was born August 14, 1899; run down and killed by an automobile May 7, 1938. He had just driven up to the church where Cled Wallace was conducting a meeting in Bessemer, Ala., got out of his car, and started across the street, when he was hit by a passing car, and never regained consciousness. He was baptized by the writer February 8, 1928, and was married to Miss Gladys Dobbs, August 11, 1933. From the time he obeyed the gospel till his untimely passing he was an interested, diligent student of the Bible, and never missed an opportunity of talking to his friends about the importance of obeying the gospel and living the Christian life. He was a good song leader, could make good talks, and would do anything he was called on to do in the work and worship of the church. In all my association with him I never heard him use a vulgar word or tell a smutty yarn. He kept the scriptural injunction: “Keep thy heart with all diligence; for out of it are the issues of life.” — JOHN T. LEWIS. We can only speculate as to how devastating this must have been for the members of the Bessemer church. Does a church continue a meeting after an event of this sort or just call it off? It’s difficult, in our day, to understand the enthusiasm that would have surrounded a gospel meeting in Queen and Lewis’ day. Perhaps Queen’s enthusiasm is also foreign to us. Something else strikes me here. Lewis’ obituaries in the Advocate really are models of restraint. They lend dignity to the lives of their subjects; they do not detract from them with wordiness or flowery vocabulary. Not that anyone ever receives formal training in obituary composition, but there’s probably a lesson there for us. Lewis also never fails to pass up an opportunity to teach with an example. Queen, he tells us, was a model of what the Scripture means that says, “Keep thy heart with all diligence; for out of it are the issues of life” (Proverbs 4.23).